Are you looking to implement the flipped classroom model but you don't know where to start? This informative presentation introduces you to the flipped classroom and is designed to answer many of your questions. This is an introductory presentation and assumes that the audience does not know much about this instructional strategy. This presentation can be customized into a 3-hour workshop where teachers actually explore screencasting software and options for publishing/hosting their videos. This engaging, timely presentation highlights a variety of web 2.0 tools, apps, and software that can greatly impact the learning environment. Teachers no longer have to wonder about how to integrate these technology tools in their classroom. Tools for assessing, collaborating, engaging, researching, organizing and writing are discussed. Teachers also receive additional resources via live binder! This can be delivered as a presentation, keynote, and with more time available it could also be a workshop. Participants will hear some common myths concerning podcasting and understand why and how podcasting can be used to help reach unmotivated learners, differentiate instruction, and communicate with colleagues, parents, and the community. 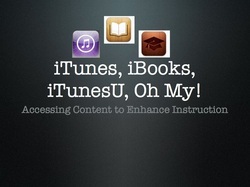 itunes, ibooks, and itunes u, Oh my!